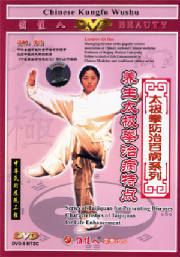 Instructional Books + DVDs for Taijiquan focussing on general principles and aspects relevant to all styles and traditions. Taijiquan for Life Enhancement is different from ordinary taijiquan. It focuses on the effect of treatment and the whole cooperation. It stressed on practicing in a group of postures or practicing a posture repeatedly. It forms a system in the aim of curing disease. To learn Taijiquan for Life Enhancement well and to use it properly, you should firmly follow the principle of " four accordings": practise according to individual, practise according to posture, practise according to disease and practise according to time. You can increase the effect of treatment if you can master the above four principles. 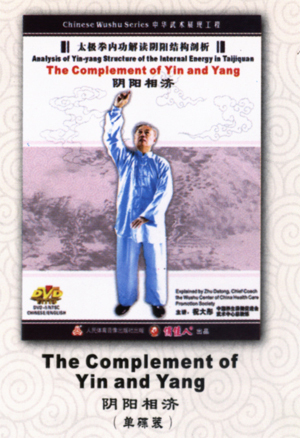 This lecture will respectively list the practise method of taijiquan for curing more than twenty kinds of ordinary illnesses, using the above four principles. The working method is very practical and easy to learn. And it has proved to have good effect according to practise. Click picture for more info. 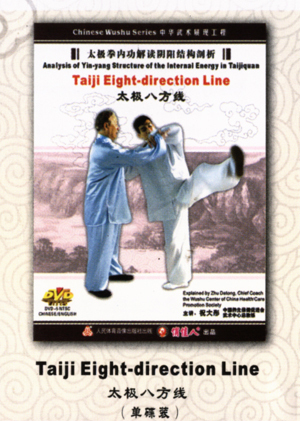 Eight-direction Line Diagram is formed by The Thirteen Postures, including eight directions, four normal directions of martial arts: east, west, south, north, and four corners directions: northeast, northwest, southeast, southwest, combining with five steps: advancing, retreating, look to the left, look to the right, central equilibrium, The circular Eight-direction Line Diagram is from a square, forming from the rim of a circle through geometry principle. Click picture for more info. 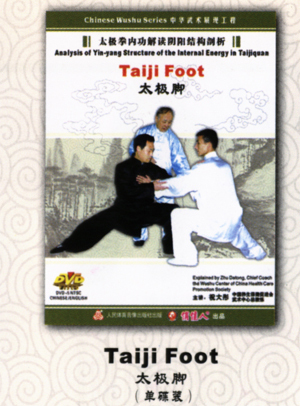 From principles for Taijiquan written by the ancestor, it is said that, the base is on the foot. The foot is the base, so relax the foot, the toes. Relax from the foot, the knee, the crotch, the waist, the shoulders, the elbows, the wrists, and the hand, from the foot to the top. The solid step is completely solid while the empty step is completely empty. Exchange the Yin and Yang when stepping. In this boxing, Yin and Yang is exchanging all on the foot. There is no need or less to move the hand, just change the Yin and Yang on the foot. Move from the foot, to the leg, and the waist without a break. The upper follows the lower, and the outer joins the inner. Click picture form more info. Taiji Hand is made of fingers, palms and wrist. Don't use hand with power so it is empty. Through the years' practice we understand that don't put power on Taiji Hands so it will move freely. If there is any block it will do harm to the health. Empty hands are good for the natural sinking of shoulders and elbows. The sinking of the shoulder is connected with that of the elbow. Relax with the 28 small joints, which have their own functions. firstly, control movement with quietude and taking advantage while in disadvantage; secondly, using the consciousness instead of power; thirdly, subduing the hardness by the softness; fourthly, countering a big power with small power. Click picture for more info. This program consists of Basic Induce, Technical Induce, Capture and Counter-capture. 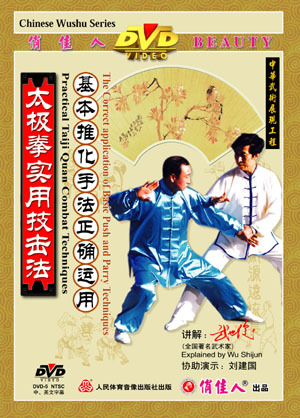 The first two parts tells how to turn the wrists, elbows and shoulders and how to defense in different situations, revealing the advanced use of Push Hand of Taiji Quan. The techniques include induce, fold, borrow force and parry. In the last part, many examples are used to illustrate the cautions and solutions in combat and the essentials and common characteristics of capture and counter-capture are also explained. Click picture for more info. The researchers who study the traditional Taijiquan know it very well that the important characteristic of Taijiquan is that the status of yin and yang play a leading role in the Taijiquan. Respond if there is change of Yin and Yang. Yin is inseparable from yang, and vice verso. The complement of yin and yang is something like Taiji totem which the fish of yin and yang are independent of each other. Because yang refers to inhaling and opening Yin refers to expanding, exhaling and joining. Click picture for more info. 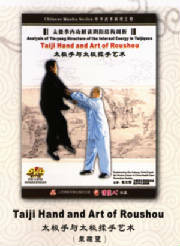 This disc begins with how to join hands, including single push at fixed stance, double push, single push at active stance, explaining in detail that the purpose of Push Hand in Taiji Quan is to move in curve and punch directly. Keep the opponent at arm's length and push him down unexpectedly. Meanwhile it emphasizes the 8 principles of stake exercise and how to take a favorable position. One must know when to induce and when to attack and the advantage of turning the waist. Click picture for more info. 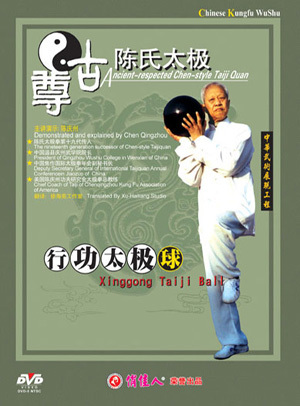 The exercise of Xinggong Taiji Ball is in order to help to raise the strength of Taijiquan, which is both good for healthy or the skill of combat. When exercising the Taiji ball, it's principal for fill Dantian with internal energy, studying storing and applying, making the ball turning around by Dantian, a foot under navel, it called from inside to outside, after studying hardly, there takes shape a Taiji ball in the belly, and this called from outside to inside, and the coordination energy between inside and outside can be shown as "Dantian twines itself". Clcik picture for more info. Pay attention to the practice of Three Move and Three No Move: That is the movement of hands without the feet's movement, vice versa, or the movement of both at the same time. 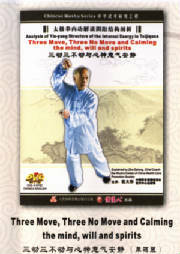 Three No Move of the body: firstly, no movements, secondly, no active movement, thirdly, no rush. Also there are Three No Move about hands, firstly no movement, secondly, not letting go, thirdly, no resistance. The Three No Move about the hands and feet: firstly, movement of hands without feet; secondly, feet's movement without the hands'; thirdly, the movement of both. 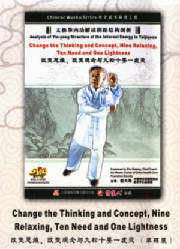 Taijiquan emphasizes on building up the body, as well as silence of mind. Practicing Quan is to calm your mind. Don't be fickle and eager for quick success and instant benefit. Click picture for more info.